George Mason picked up its first home win of the season in EagleBank Arena Saturday afternoon, defeating Wright State 66-39 behind solid defense. The Patriots held the Raiders to a 23.1 percent shooting effort, while shooting 46.2 percent from the field. -Mason led at the halftime break 32-10 behind a 42.9 percent shooting effort. Wright State was held to a 7.7 percent shooting effort and was just 2-for-26 from the floor. -The Patriots jumped out to an 8-0 lead out of the gate and held the Raiders to single digits for nearly 15 minutes of action. -With just over two minutes left in the first half, Mason gained its first 20-point lead with the halftime score. -The last time Mason held an opponent to 10 points in the first half was against UNC Wilmington on January 8, 2007. The Seahawks shot 8.7 percent in that first half. -To open the second half, Mason raced out to a 26-point lead, but the Raiders quickly drew it back to a 21-point deficit. -Mason would never relinquish a 20-point advantage in the second half, leading by as many as 28 points with2:07 to play. -The last time Mason held an opponent to 39 points in a game was on November 15, 2011 against Monmouth when Mason won 71-39. -Mason’s defense held Wright State to a bleak 7.7 percent shooting effort in the first half. The Raiders finished the game shooting 23.1 percent from the floor. -For the game, Mason shot 46.2 percent from the field after a 42.9 percent first-half effort. The Patriots shot 36.4 percent from three-point range and 66.7 percent (10-15) from the charity stripe. -Two Patriots scored in double-figures paced by Marquise Moore who finished with 12 points, seven rebounds and five assists on the night. 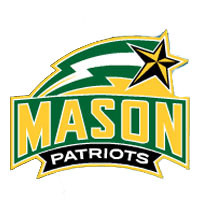 Offensively, Otis Livingston II led Mason with 14 points. The freshman finished with three assists and one steal. -The Patriots won the rebounding battle, 43-31, fueled by seven rebounds from both Moore and DeAndre Abram. Jalen Jenkins added six rebounds and two blocks. -Only one Raider reached double-figure scoring numbers in Grant Benzinger with 11 points who was 3-for-5 from long range. -Mason converted 10 Wright State turnovers into 17 points, while Mason’s bench contributed 27 points. -Mason makes the short trip to visit Towson on Wednesday for a midweek matchup. Tip time is slated for 7 p.m. in Towson.